Password Manager, How do I change my NetID Password? If you want to change your password, cannot remember your password, or had your password scrambled by Security there are three options that are available to you when you visit the password manager. Please remember that as soon as you change your password that you will need to also change any saved passwords on your desktop, laptop, or mobile device. In order to perform the steps below, you will need to visit the password manager. You will be prompted with a screen to confirm your recovery options and modify them if you wish. Once you are finished, click on "save and continue". On the following screen, type in the new password you wish to use. As you start typing, green checkmarks will indicate if your password meets all security requirements. 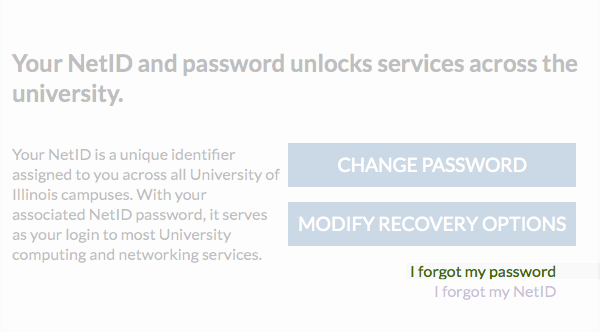 Follow the onscreen prompts to use one of the three recovery options you have set up: Non-University email address, text, or phone callback. You will be sent a code to the method chosen in step 3. This code will be valid for 10 minutes and will be used to verify your identity and allow you to reset your password. You will need to stop into the Technology Services Help Desk with your i-card. A staff member will assist you with resetting your password.